In 1996, a handful of traditional Irish mouth-blown crystal makers, fed up with the increasing automation of their beloved industry, moved to Halifax, Nova Scotia to set up NovaScotian Crystal. Today their business is thriving on the Halifax Waterfront, and they are still the only crystal makers in Canada, let alone mouth-blown crystal makers. When you come to Halifax, make sure you stop by the shop at the base of George Street and near the Celtic Cross. 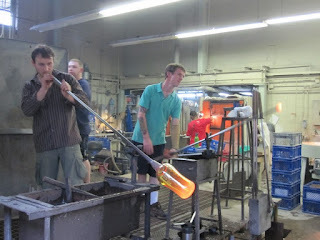 It's always a treat to watch the crystal artisans at NovaScotian Crystal take a blob of molten hot glass from the 1 300 degree centigrade oven, and then by working as a team, turn it in to a truly magnificent work of art. You can watch a video of the procedure here.